Roll out pizza crust to desired thickness on a pizza sheet. Brown hamburger and microwave bacon. Spread tomato sauce over unbaked crust. Sprinkle the basil on top. Next top with the package of cheese. 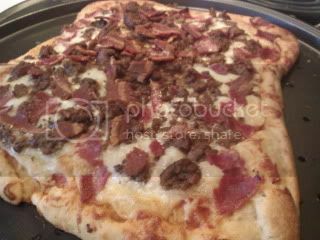 Follow with the cooked hamburger and bacon. Bake in the oven at 425 for 8-13 minutes. Enjoy! You can use whatever toppings you would like - Spence and I usually like the meatlovers. This is our version, but usually on the Pillsbury pizza crust tube you can follow the directions on there for their pizza. omg YUM. I'll be trying this out asap!